About 5 years ago, my husband and I finally acknowledged that, yes, our children were indeed all grown up; they were not moving back home; and when they come to visit, a different set of sleeping arrangements were in order. This realization brought us quickly to another—we have four bedrooms that are not in use most of the year. These rooms were ripe for re-making. The room that is the focus of this particular reflection is what we affectionately referred to as “the girls room.” With a fair amount of elbow grease and about 8 large plastic storage tubs, we transformed this space into my creative cave. Out with the twin beds, the large dresser and various and sundry knick-knacks and childhood memorabilia; in with Matilda (my dress form), a sleeper sofa, a book case, sewing machine and all the accouterments of sewing, beading, artwork, writing and eventually, weaving. When the children do come home, however, this creative studio needs to return to its former life as a bedroom. The easiest way to make this happen is to take all the in-process projects, stack them and hide them in the large closet that is a lovely part of this space. A bit of vacuuming and, voila! We have a guest room. The problem, which you probably have deduced, is that the closet hides, all too well, the bits of creative genius within. Which brings me to this past weekend. I have been itching to start something, but could not name said project. Aha! 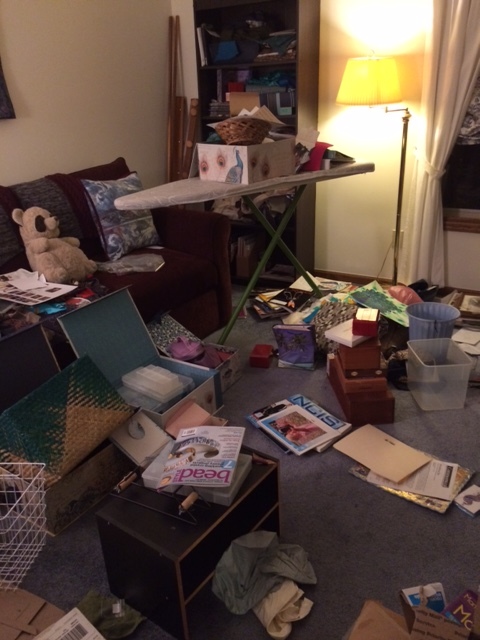 Before I dare begin a new project, the light-bulb went on–some re-organization of the creative cave needed to happen. So I sat amidst the mess and surveying it, made a triage list. First task–the new cube. 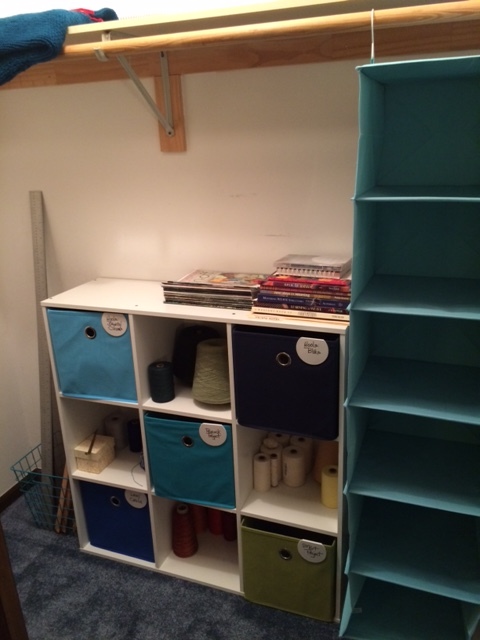 Cube organized with weaving supplies—check! More news and pictures to come next week. Next:Feathering Friday: Oh Autumn, where art thou? Looks like a great start! 🙂 As a fellow crafter, seamstress, and mom … hats off to you!